Jacobsen Elektro was in May 2014, awarded a large and groundbreaking contract in our Norwegian market with Statnett at an approximate value of 100 million Norwegian kroner. Statnett will build a 150 km long new 420 kV transmission line from Ofoten to Balsfjord and the project has a budget of nearly 3.7 billion NOK. This is part of Statnett’s major commitment to safeguard the security of supply of electricity throughout Northern Norway north of Ofoten and will facilitate increased value in the region and contribute to the development of renewable energy can be realized. 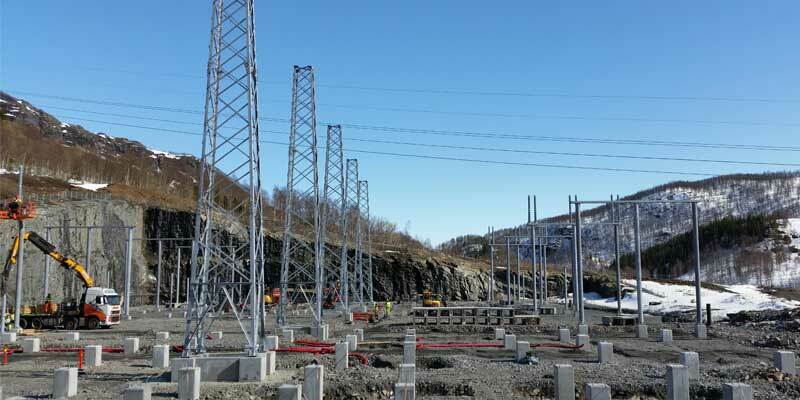 Jacobsen Elektro’s delivery is a turnkey expansion and upgrade of the 420 kV Substation Kvandal, north of Narvik. The work has long since started up with the necessary engineering and planning. Construction work on the substation itself started up in October 2014 and technical installations started up in March 2015. The project is scheduled transferred to Statnett by the end of 2015. The substation in Kvandal is very important for the power supply in northern Norway and will be in operation during the entire construction period, which implies extremely stringent focus on health, safety and environment. The civil engineering works of the substation are significant and includes a completely new control center building of almost 500 m2. For these tasks, Jacobsen Elektro entered into an agreement with the local company Harstadbygg AS. The technical installations in the switchyard includes all new appliances at 420 kV with accompanying steel racks and connection of new lines.